The Richard Harrison Collection of Calligraphy and Lettering was organized in 1963 through the efforts of City Librarian William Holman and Theo Jung, calligrapher and book designer. With their encouragement, local calligrapher Richard Harrison donated his private collection to the library and continued to provide support throughout his lifetime. The collection contains over 3,000 examples of contemporary calligraphy, including manuscripts, broadsides, handwritten books, fine prints, drawings, sketches, and roughs. More than 400 hundred individual scribes and lettering artists are represented. Perspective on the development of book hands is provided by a selection of medieval through seventeenth century leaves and books. A reference collection of over 1,300 works supports the study and practice of calligraphy. For the lover of calligraphy and all that is associated with the making of a fine book, the Book Arts & Special Collections Center of the San Francisco Public Library will be the site of many hours of interest and pleasure. The library is home to the Richard Harrison Collection of Calligraphy and Lettering, now in existence for over 40 years. It is also the repository of the Robert Grabhorn Collection on the History of Printing and the Development of the Book. This account focuses on the library's calligraphic riches, but mention is made of the typographic materials available to the student of fine letters, because each collection properly complements the other. Richard Harrison, 1909-1990 The Harrison Collection is internationally renowned as one of the largest and best gatherings of twentieth century calligraphy. Begun in 1963, it is named for its first benefactor, Richard Harrison (1909-1990), who gave the library many works he had acquired or privately commissioned from English, American, and European scribes. The collection has been continuously expanded by purchases and gifts since its inception. It presently numbers over 1000 examples of modern calligraphy, including original manuscripts, broadsides, handwritten books, fine prints, drawings, working layouts, and photographs. Over one hundred scribes and lettering artists are represented. A reference collection of books on calligraphy and the history of writing features over 900 titles. The special beauty of original calligraphy is amply demonstrated in the Harrison Collection. For visiting calligraphers the collection has long been a favorite attraction. A valuable resource for study and inspiration, it is regularly used by teachers of calligraphy in the San Francisco Bay Area, who have brought innumerable students to the library over the years. However, as a public access collection, anyone with an interest in the work may examine it directly. No special research purpose is necessary. click to enlarge The Robert Grabhorn Collection on the History of Printing and the Development of the Book, acquired by the library in 1965, was the result of many years of effort by Robert Grabhorn, the San Francisco printer, who had a scholarly interest in the history of printing and typographic design. There were over 1600 titles in the original collection representing almost every notable printer and publisher of the past 500 years. Today, the typographic holdings include approximately 3000 reference works on printing, typography, binding, and papermaking. Approximately 4500 books exemplify fine printing historically and in modern times. The work of sixteenth-century French and Italian printers is especially well-represented, as are early type specimens and printers' grammars (or how-to books for printers). Highlights include Joseph Moxon's Mechanick Exercises of 1683, followed by many European and American printing manuals dating into the twentieth century. Also to be found is the work of such modern masters as William Morris, D. B. Updike, Bruce Rogers, and, of course, books from the Grabhorn Press. The Book Arts & Special Collections Center has sponsored or hosted many events for local book arts practitioners, including lectures, meetings, and demonstrations on calligraphy and related topics. The library has also been the location of many exhibitions of calligraphy and printing. These have included displays both large and small from the Department's holdings, as well as traveling exhibitions and members' shows by groups such as the Friends of Calligraphy, the Pacific Center for the Book Arts and the Hand Bookbinders of California. Single-artist shows sponsored by the Book Arts & Special Collections Center have featured the work of, among others, Alan Blackman, Rick Cusick, W. A. Dwiggins, Rose Folsom, Tim Girvin, Robert Haas, Michael Harvey, Karlgeorg Hoefer, Thomas Ingmire, Byron Macdonald, Friedrich Neugebauer, Hans Schmidt, Werner Schneider, John Stevens, Hermann Zapf and Gudrun Zapf von Hesse. It is worth recounting how something as unique as the Harrison Collection came to be. 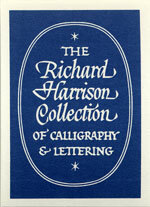 Richard Harrison was himself a calligrapher who became interested in collecting work from other scribes. As a young man he studied mechanical lettering and commercial art. In 1954 he met Byron Macdonald, the San Francisco calligrapher, and later took classes from Macdonald in broad-edged pen writing. Soon thereafter, he began to assist Macdonald with his work, and continued to do so for many years. Eventually, he built up his own clientele, and remained active as a part-time commercial scribe for several decades. click to enlarge After Harrison discovered formal broad-edged pen calligraphy, he developed an interest in cursive italic handwriting. Wishing to use a fountain pen with a broader nib than was available at that time, he experimented with reshaping the nibs of ordinary fountain pens. On this subject he began to correspond with Anna Hornby, who was then the Secretary of the Society for Italic Handwriting in England. Since she was left-handed, she was unable to test Harrison's right-handed nibs. She suggested he write to Alfred Fairbank, an early leader among the italic handwriting group. Harrison began sending his pen nibs to Fairbank for testing. Fairbank became a regular correspondent, and eventually Harrison commissioned him to do an example of formal calligraphy. Although Fairbank, for one reason or another, was never able to fulfill this request, he did send him some original pages of handwriting from his published handwriting manuals. These manuscript pages, as well as Fairbank's letters, are now held in the collection. Another correspondent from those days was John Howard Benson of Newport, Rhode Island. Harrison sent him some of his nibs, which pleased Benson so much that he recommended that the Esterbrook Company adopt Harrison's techniques. But the machine-tooled nibs failed to live up to the quality of those that had been altered by hand. click to enlarge Harrison's fascination with italic handwriting sparked an interest in collecting other materials on the subject of calligraphy. At first, this was limited to such things as printed books and relics such as unbound leaves from medieval manuscripts. In 1956, responding to an English book dealer's advertisement in the Society for Italic Handwriting's Bulletin , Harrison obtained several calligraphic items by Edward Johnston (1872-1944), who is considered responsible for the development of modern calligraphy in England. This purchase dates the beginning of Harrison's interest in forming a collection of manuscripts by contemporary calligraphers. Ultimately he decided to acquire examples of formal calligraphy from the best professional scribes. click to enlarge In 1957 this led him to the commission of a series of Shakespearean sonnets written out in italic script by English scribes. Through Fairbank, who was then President of the Society of Scribes and Illuminators, he obtained a list of scribes who were invited to contribute. Those who responded included, among others, Ann Camp, Heather Child, Dorothy Mahoney, Joan Pilsbury, Sheila Waters, Irene Wellington, Wendy Westover, and John Woodcock. The Shakespearean sonnets led to contacts with other British scribes over the years. Harrison either purchased existing work or commissioned pieces to be made. He began to acquire things from American calligraphers as well, though it proved to be more difficult for him to get formal manuscripts from such professionals as James Hayes, John Howard Benson, and even Byron Macdonald. Always generous, Harrison delighted in sharing or exchanging his treasures with correspondents. For example, manuscripts by Paul Standard and Jeanyee Wong were given to Villu Toots in Estonia. However, as his collection became known, requests for exhibition loans grew frequent. In some cases work wasn't returned, or was damaged. When, in 1963, Harrison got the opportunity to donate his collection to a public institution, he realized that one advantage of doing so would be to free himself from the problems and risks of loaning work to others. click to enlarge The gift of Harrison's collection to the library was made shortly before the original Special Collections Department was officially formed, in 1964. 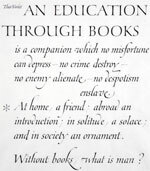 William Holman, then San Francisco City Librarian, and Theo Jung, a San Francisco book designer and calligrapher, had already begun a calligraphy collection for the library. Some pieces of original calligraphy by European scribes had been obtained from Jung, who then proposed to Harrison that he donate his collection to the library. Harrison assented, and thus began the long association between the library and its benefactor. Harrison was an avid collector of Angel's work over a period of nearly two decades, and the library possesses many examples. Also to be found in the collection are the vellum originals for The Twenty-third Psalm (published in book form in 1970), the incomplete manuscript book Exotic Birds , and a portfolio of botanical floral illustrations. The collection contains several notable manuscript books commissioned or acquired by Harrison from English scribes. Elizabethan Poems and Sonnets , written out by Ida Henstock, was completed in 1971. It is decorated and gilded in the same highly finished style in which she illuminated many commissions with Graily Hewitt. It was the last important work she completed before her death in 1982. An outstanding work is Sheila Waters' 1965 manuscript of T. S. Eliot's poem, "The Hollow Men," designed in collaboration with her husband Peter Waters, the noted bookbinder. Created as an accordion-fold book, it is written on seven alternating panels of grey and purple paper and bound in black morocco leather. Other English manuscript books that are especially prized are Margaret Alexander's The Rose from Logan Pearsall Smith's All Trivia , and Heather Child's The Running Winds of Spring Time: Quotations from English Poetry , illustrated with her own pen and ink drawings. Many manuscripts from British calligraphers were eventually acquired by Harrison. These include pieces by William Gardner, Tom Gourdie, Graily Hewitt, Donald Jackson, M. C. Oliver, Thomas Swindlehurst, and Violet Wilson. The library later acquired works by Hella Basu, Will Carter, Ann Hechle, David Howells, David Kindersley, Charles Pearce, Ieuan Rees, Peter Thornton and David Williams. Harrison also collected works by European scribes. Several outstanding examples have been contributed by Pamela Stokes, an Englishwoman who has lived in Mainz, Germany, for many years. Trained in Hamburg under Frieda Wiegand, her style reflects the German tradition. Her manuscript of Richard Jeffries's Wild Flowers was commissioned by Richard Harrison in 1964. It is fifty-six pages in length, illustrated throughout with delicate ink and watercolor botanical drawings. Works by the Austrian calligrapher Friedrich Neugebauer (1911-2005) were acquired by Harrison in the early 1970s, including several original broadsides and two Shakespearean sonnets. One unusual example is written in a monoline uncial script using gold on purple Brazilwood-dyed vellum. click to enlarge The work of Hermann Zapf, the prominent German calligrapher and type designer, is well represented. A highly-prized original broadside by Zapf is An Education Through Books , commissioned by William Holman in 1966. It is a consummate example of Zapf's style in calligraphy. Many rare editions of his books can be found in both the Harrison and the Grabhorn collections, including a first edition of his Manuale Typographicum . Gudrun Zapf von Hesse, also renowned as a calligrapher and type designer, is represented in the collection. She has been the wife of Hermann Zapf for more than fifty years. These two individuals were celebrated with an exhibition and lecture series at the San Francisco Public Library in September and October 2001. Zapfest, as these events were dubbed, was presented and sponsored by the Friends of Calligraphy. The exhibition, entitled "Calligraphic Type Design in the Digital Age," also displayed the work of fourteen other distinguished calligraphic type designers. The series of Zapfest events included lectures by both Zapfs as well as by such other notable typographers and calligraphers as Jack Stauffacher, Sumner Stone, Larry Brady, Susan Skarsgard, Cynthia Hollandsworth Batty and Robert Bringhurst. Other twentieth-century calligraphers, from Europe and other countries, whose works are to be found in the collection include Hans-Joachim Burgert, Claude Dieterich, Roger Druet, Rudolf Koch, Hans Ed. Meier, Friedrich Poppl, Leonid Pronenko, Werner Schneider, Villu Toots, and Jovica Veljovic. Karlgeorg Hoefer (1914-2000), the prominent calligrapher and type designer from Offenbach, Germany, visited the San Francisco Bay Area often in the 1980s to teach summer classes. A series of original demonstration pieces were donated by American students to the collection, complementing other examples of his work previously acquired by the library. More recently, the Library has acquired a number of works by the German calligrapher and artist Hans Schmidt. These include examples of original lettering, typographic design, woodcut prints, limited edition books, and wood sculpture. Over the years, Harrison developed friendships with the artists whose work he collected. Marie Angel is an example. Another is Thomas Ingmire, a prominent San Francisco calligrapher and teacher, from whom he commissioned or purchased a number of pieces. In 1989, not long before Harrison's death, Ingmire delivered a final commission, the manuscript book, Alchimie du verbe (poetry by Arthur Rimbaud). It was one of Harrison's treasured possessions, and was exhibited at the library as unbound pages in 1987, prior to its presentation. The library also acquired all the working drafts, drawings, and notes that preceded the making of this remarkable work. American calligraphy is very much represented in the Harrison Collection, although somewhat differently from the English and European examples. Leading American calligraphers, until the last thirty years or so, did not regularly produce such traditional work as illuminated manuscript books. Several of the best known names in American calligraphy, for example Raymond F. DaBoll and Byron Macdonald, were primarily calligraphic lettering artists who served the needs of publishing and advertising. It was rarely possible for them to accept commissions from collectors such as Richard Harrison. In the case of the two men just mentioned, each is represented in the collection by a large portfolio of layouts, artwork for reproduction, and printed items. click to enlarge The library has consistently made efforts to fill gaps in its collection of American work, when possible, from purchases and gifts. 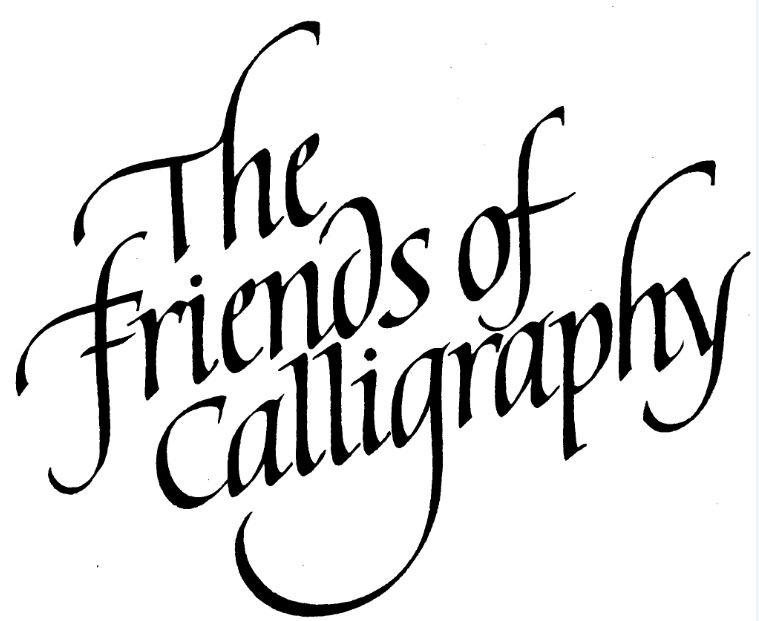 Today, examples by many eminent American calligraphers are available for study. These include works by Harold Adler, John Howard Benson, Edward M. Catich, James Hayes, Alice Koeth, Edgon Margo, Maury Nemoy, Lloyd Reynolds, Jeanyee Wong, and Lili Cassel Wronker. Original calligraphy by the younger generation of American scribes (many from the West Coast) has been a particular focus of acquisition during the last twenty-five years. A partial list of these calligraphers includes Barbara Bash, Alan Blackman, Philip Bouwsma, Larry Brady, Marsha Brady, Cherie Cone, Georgia Deaver, Judy Detrick, Ward Dunham, Rose Folsom, Tim Girvin, Georgianna Greenwood, Jenny Groat, Victoria Hoke Lane, James Lewis, Richard Lipton, David Mekelburg, Suzanne Moore, Anna Pinto, John Prestianni, John Stevens, William Stewart, Sumner Stone, Jacqueline Svaren, Brenda Walton, Julian Waters and Arne Wolf. The Book Arts & Special Collections Center has continued to acquire new original pieces and books. Many have come as donations from the personal collections of calligraphers. These have included many items from the collections of Marsha and Larry Brady, Lili Cassell Wronker, Carol Nemoy and others. Hermann and Gudrun Zapf have been particularly generous in donating examples of their work. To keep pace with the city's changing needs for library services, a new library was built and opened in 1996, adjacent to the original building in San Francisco's Civic Center. The original library building has been renovated and is now home to San Francisco's Asian Art Museum. The caretakers of the collections fill a vital role in conserving the materials, directing acquisitions and activities, and assisting visitors. Anne Englund was head of the Special Collections Department from 1975 to 1977. Through her efforts the Department's Rare Book Room became more accessible to the general public. She was also influential in initiating the programs involving calligraphers and members of the local book community. She encouraged the acquisition of work from promising new calligraphers. The department was renamed when the new library opened; it was designated the Marjorie G. and Carl W. Stern Book Arts & Special Collections Center. Currently, Lisa Dunseth is the Program Manager for the Center and is responsible for the Grabhorn Collection. Andrea Grimes has worked in the department since 1992 and is the Special Collections librarian in charge of the Center's Schmulowitz Collection of Wit and Humor (SCOWAH). Susie Taylor, the curator of the Harrison Collection, has been associated with the library since 1977, and is well known to many visitors of the Rare Book Room. A gifted calligrapher in her own right, Susie Taylor has brought considerable talent and dedication to the task of caring for the Harrison Collection. She has also, for many years, been instrumental in fostering its use by the calligraphic community and other interested patrons of the book arts. Richard Harrison died in 1990, at the age of 80. His passing was a great loss to his friends everywhere, to those who were inspired and encouraged by his patronage, and especially to the calligraphic community in Northern California, who had been accustomed for so many years to his familiar and welcoming presence at the library and at local events. His contribution to this unique craft lives on in the work gathered and preserved in his name. Together with all the bibliophilic treasures in San Francisco's Book Arts & Special Collections Center, the results of his efforts can be used and appreciated today, and for generations to come. John Prestianni was the founding editor of "Alphabet, The Journal of the Friends of Calligraphy," and has written and taught extensively on calligraphy, typography and the book arts. Originally trained as a calligrapher, he has produced hand lettering for a wide range of commercial purposes, and worked for many years as designer of books and publications. © 2005 by John Prestianni, reprinted by permission of the author.